This Howard Miller Mia Mantel Clock from Clockshops can be called style at its best. It is finished in Worn Black with red and brown undertones on select hardwoods and veneers. This handsome mantel clock features fluted columns with raised beveled column caps and flat glass that encase the dial and brushed antique brass-finished pendulum bob with brass-finished stick. This chic looking wall clock has been designed to utmost perfection to give it a different look that makes it exclusive. 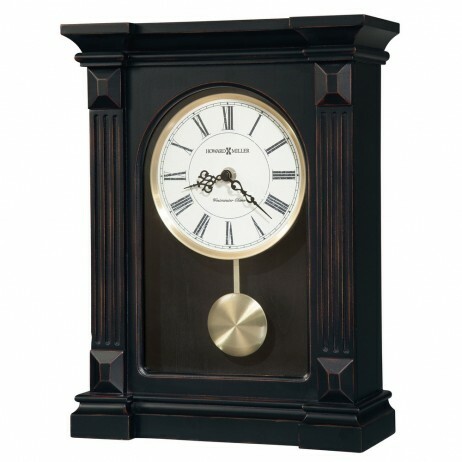 Finished in Worn Black with red and brown undertones on select hardwoods and veneers, the handsome mantel clock features fluted columns with raised beveled column caps and flat glass that encase the dial and brushed antique brass-finished pendulum bob with brass-finished stick. Aged dial with aged black Roman numerals, black serpentine hands, and a brushed antique-brass finished bezel. Quartz, battery-operated, single-chime movement plays Westminster chime on the hour and counts the hour. Automatic nighttime chime shut-off. Expressions of Time is an authorized Howard Miller dealer. 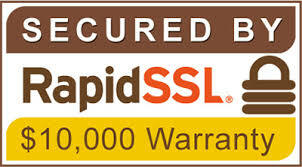 This means you’ll receive an authentic Howard Miller clock, covered by the one year manufacturer’s warranty. 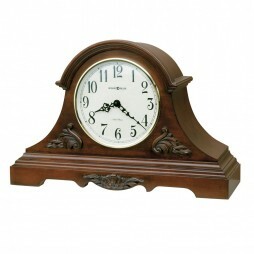 Add a rustic charm to your home with Howard Miller Cynthia Dual Chime Mantel Clock. The stylish timepiece offers decorative details that embellish this charming mantel clock from top to bottom. Elegant leaf motifs adorn the bezel and front wrap-around legs. Floral and vine overlays and decorative molding further enhance the base. An aged dial with convex glass, Roman numerals, and decorative hands completes the picture. Finished in Americana Cherry on select hardwoods and veneers. Unique and stylish, this Howard Miller Urban Mantel Clock II will help you keep track of time in a convenient way. 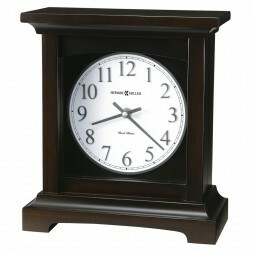 Modern mantel clock in a very dark brown “Black Coffee” finish. The dial features nickel-colored Arabic numerals with white background. Black Coffee finish on select hardwoods and veneers. Quartz, dual chime movement plays Westminster or Ave Maria chimes, and features volume control and automatic nighttime chime shut-off option. Featuring an striking design, this clock is sure to blend with your other home decor. Enhance the look of your home walls with Howard Miller Nicholas Tambour-Style Mantel Clock. 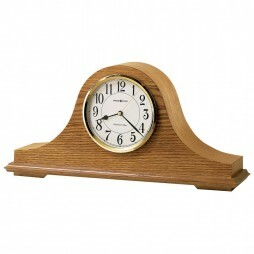 Traditional tambour shaped mantel clock. The off-white dial of this classy mantel clock offers a convex glass crystal, a polished brass finished bezel, black Arabic numerals and a brass second hand. Moreover, a quartz battery operated movement will play Westminster chimes on the hour and counts the hour. 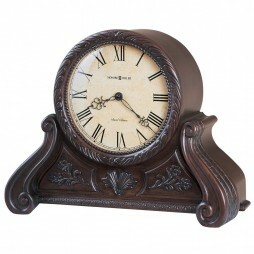 Sporting a classy design and an elegant shade, this clock will blend with any background.